Boombet is an interesting top Australian online casino sporting a very slick design and some great games. While it’s not as established as some other top casinos in the Australian market,it has plenty to offer. So, is it worth signing up at Boombet casino and trying it out? Once we’ve put it through our stringent review process, we’ll be able to tell you whether you should sign up immediately or avoid this casino. Read on to find out what the Casino Aus verdict on Boombet is! Boombet has a rather simple welcome bonus, which is great for new players, offering a 200% bonus up to AU$6000. The casino also does a fantastic job of telling players what the wagering requirements are up front as well as the games that count towards completing it. We really like seeing such great transparency when it comes to the terms and conditions attached to casino bonuses. It comes with a 35x wagering requirement, which includes the initial deposit plus the bonus. Boombet also offers players cashback bonuses of up to AU$50. While these two options are probably the most needed options, a phone line would have made it even better. On the plus side, the support is available 24 hours a day. Boombet is a multiplatform casino, meaning it gets its games from a variety of developers. 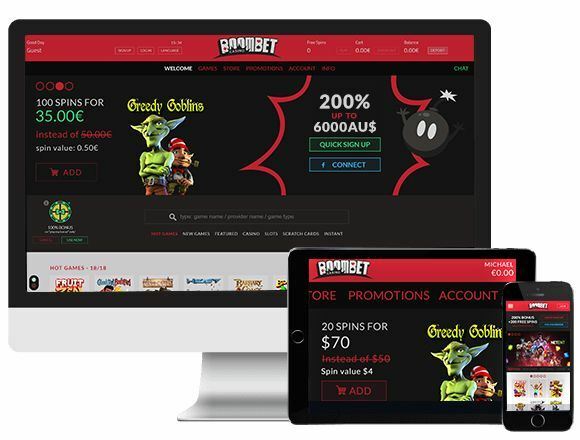 Boombet is one of Australia’s best online casinos and not only do their games come from some of the best-known developers out there, but also some of the lesser known ones. This means that Aussie players will be able to find some games at Boombet that they will struggle to find at other online casinos. Some of the developers they have partnered with include Microgaming, Vivo Gaming, Rival, Sandstorm, BetSoft, and Spinomenal. In total, there are just over 1100 games available. These include over 800 pokies, as well as nearly all the classic table games such as Roulette, Poker, Blackjack, Craps, and Pai Gow. Boombet allows players to enjoy their casino offerings from their smartphones or tablet. The website has been optimised for mobile users, so players don’t have to download anything. Players just need to head over to the website from their smartphone or tablet, log into their account and have fun. Players using Apple, Android, Windows and even some Blackberry devices will be able to have a great time, no matter where they are. Boombet Casino offers plenty of great things for Australian players. It does, however, falter ever so slightly in some areas, but this doesn’t change the fact that it is still a great casino. The look is great, and we loved some of the animations that made the website feel more alive, not to mention the great welcome bonus . The game selection is pretty absolutely fantastic, we’re sure you won’t get bored anytime soon. Besides a few small stumbles, such as no phone number for customer support, we feel confident that this is definitely a casino we can recommend to our readers. In the end, we give this casino top marks, 5 out of 5!.